Click HERE to Choose the Right Storage heater model for you or contact 012-604 3731 formore details explanation. · All plumbing works must be completed and heater tank fully filled with water before proceeding to electrical connections. This will prevent any damage to the heating element and thermal fuse. 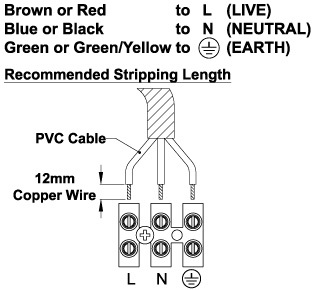 · Do not use ABS or PVC plastic pipes for the inlet and outlet connections. Use only recommended stainless steel, copper or polymer pipe which can withstand high temperature and pressure. · Do not install in area where the water supply exceed 20mg/litre (20ppm) of chloride as this cause corrosion to the stainless steel heater tank and void the warranty. 1. Select a suitable location for convenience of water and electrical supply as well as easier for future maintenance. Make sure the location is free from water splash. 2. 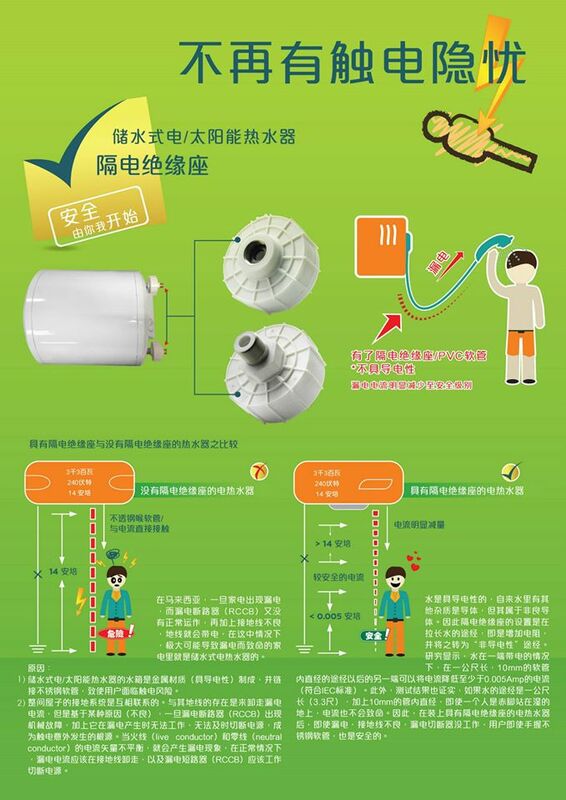 In case the water supply is from the water tank, the water heater should be connected to a booster pump (minimum 0.15 MPa / 1.5 bar), in order to have sufficient hot water flow. position, according to the type of mounting position required (Refer figure A). 3.2 Mark and drill 4 holes (Ø11mm X 60mm) with dimension C and F (Refer figure C). 3.3 Insert the expansion bolts firmly to the holes and remove the hex nuts and washers. 3.4 Mount the mounting rings in position to the expansion bolts. 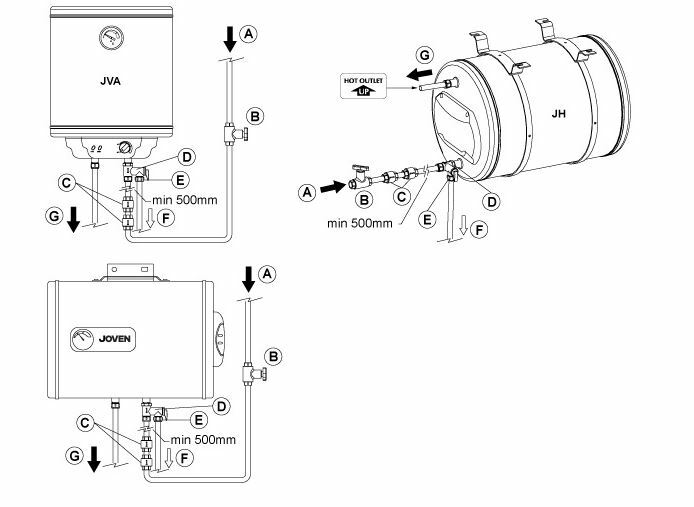 Ensure the inlet pipe is at the lower position (Refer figure A). 3.5 Securely fasten the washers and hex nuts. Reinstall screw X and Y. 4.1 Mark and drill 2 holes (Ø11mm X 60mm) with dimension C and F (Refer figure C). 4.2 Insert the expansion bolts firmly to the holes and remove the hex nuts and washers. 4.3 Mount the mounting bracket in position to the expansion bolts. This appliance is designed for vertical mounting to the wall only. 4.4 Securely fasten the washers and hex nuts. 5.1 Refer to figure B, mark and drill 2 holes (ø11mm x 60mm depth) on the wall. 5.2 Insert the expansion bolts firmly into the holes and remove the hex nuts and washers. 5.3 Fix the wall bracket to the expansion bolts and securely fasten the washers and hex nuts. 5.4 Carefully hang the mounting bracket of the heater to the wall bracket on the wall. 1. Install 1 or 2 unit of check valve to ½” BSP connection at end of pressure relief valve (With blue cap). · The position of the check valve(s) must not be too close to the pressure relief valve. A length of 500mm is good for thermal expansion. · The pressure relief valve is for protection against excessive pressure in the heater tank and must not be removed or replaced. When the heating element operates, it is normal for water to drip from the drain valve. 2. 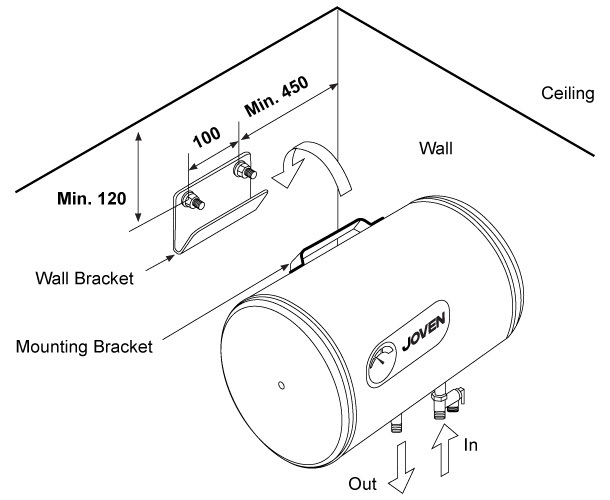 Connect cold water supply line to the check valve. 3. Connect hot water line to the outlet pipe (With red cap). 4. Connect a 15mm (1/2”) diameter copper tube (maximum length 9 metres) to the drain valve end, leading downward to a drain that is open to the atmosphere and in a frost-free ambient, so that in the event of excessive pressure in the storage tank, the flow of water will not cause damage to the surroundings or critical areas of the building. Drain valve must not be closed or blocked which may cause serious damage to the heater tank and void the warranty. 1. Open control valve in cold water supply line and all hot water faucets to allow trapped air to be vented out from the heater tank and piping. 2. Allow the heater tank to completely fill with water as indicated by a steady flow of water from the hot water faucets without switching on the electrical supply. 3. Turn off all hot water faucets. Check all pipe connections to ensure that they are properly sealed against leakage. 3. Remove installation cover screws. Gently lift up the cover. 7. Provide sticker label if two heater ON / OFF switches are used to control it. 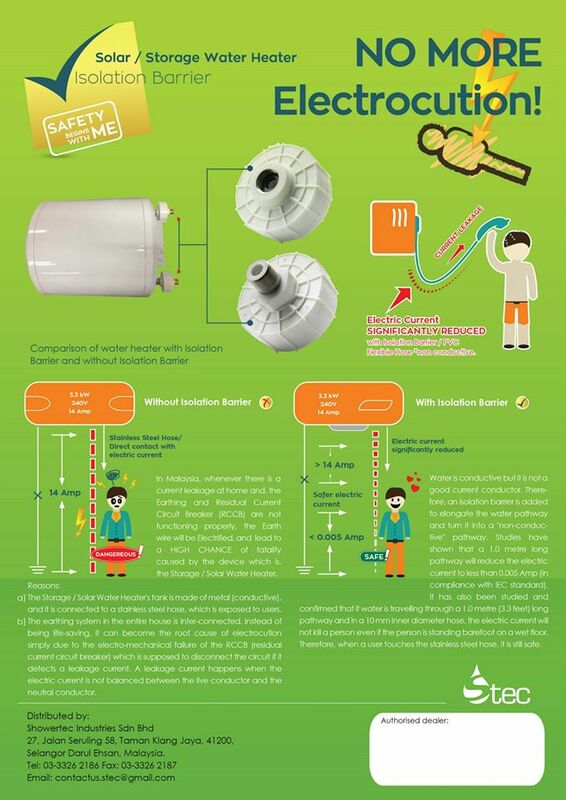 The first operation and heating of the appliance must be observed by the installing technician after water and electrical connection have been made and heater tank filled with water, before switching on the electrical supply.